It had to happen eventually. I am a very flower-hungry gardener. In the middle of a cold, gray February. And there was a whole stack of miniature roses in front of the check-out at the store. Does anyone else feel sheepish over buying gift plants for themselves? 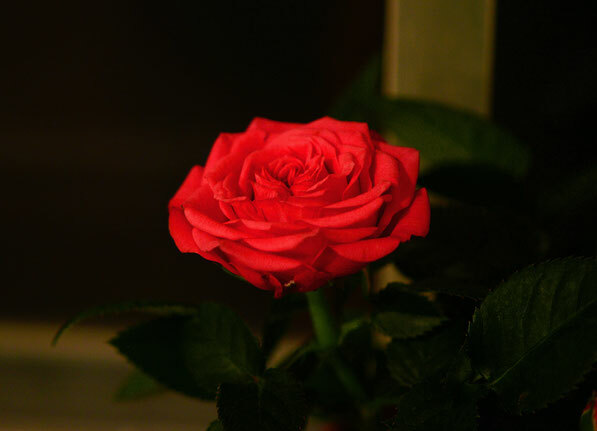 Valentine's and Mother's Day are my downfall because that is when the miniature roses pile onto the stands at any grocery or Walmart in the US. This tiny rose was clearly meant for the Valentine's Day gift market, but a rose is a rose is a... It fell into my shopping cart somehow, as others have before! I hope Cathy will pardon this rare deviation from the letter of 'In a Vase on Monday', her inspiring weekly theme at Rambling in the Garden. This is not anything - flower, foliage, berry, or bud - in a vase. It is unquestionably a plant in a flower pot. Yes. To excuse myself, the thought of bringing it home, potting it up, and posting about it for today was part of my rationale for purchasing it. Why exactly I needed a rationale I can't say, but there it is. My sister must understand, as she was the one who managed to suggest it! And it does seem doubly appropriate somehow, in light of Cathy's own unusually rosy vase this week! The little pot is one of my own making. For the past two months or so it has been loosely tucked into a much larger pot that contains much larger roses: about five rooted suckers which I dug shortly before leaving Arizona. They are all off of the antique 'Communis', the first known Moss Rose, a sport from Rosa centifolia. Amazingly, at least two of them appear to be in good health, with little pale buds forming at the joints of old leaf axils - a sight guaranteed to warm a rose-lover's heart. After all they have been through I had thought there was no chance of any survivors. But those grand dames of rosedom are grand indeed, and very sturdy. 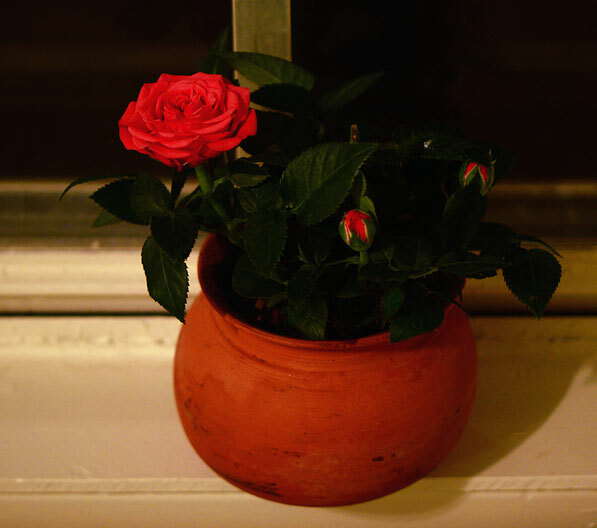 In any case, the little pot came indoors recently and was available for a very tiny rose bush to be slipped into it tonight. Shall we say that at least the indoor component of the new Small, Sunny Garden has begun? I love everything about this: and yes, I certainly do buy potted plants for myself. In fact, I just bought a Primrose in the most gorgeous orange/yellow combination, brought it home, repotted it and now will have to post, thanks to you! I love the pot, by the way. Well done! We all—but especially you—deserve to buy things like this for ourselves. I'm glad to see that you're planning to have miniature roses in your new garden too. This is the first of many I'm sure! It's a lovely little rose Amy, and has found a good home! I have also been cheating a little with my 'vase' posts recently, but a warm spell is coming our way, so I might even have something to cut from my new garden soon. Glad some of your roses have made the journey with you. Starting a new garden can be so exciting! A housewarming gift to encourage your rose cuttings. Totally appropriate! Libby - Your primrose sounds like just the thing to get a big breath of spring fever! It was lucky I had a few little flower pots with me ;-). I’m looking forward to getting the rest of my pottery here so I can reopen shop, but right now it’s still in storage. So anxious to be really settled! Kris - You know me well... ;-) I wasn’t planning on doing much with miniature roses initially, but I’m definitely starting to plan them in now. For garden use, though, I’ll probably be ordering the hardier varieties from someplace like High Country Roses rather than trying to use the greenhouse types. The latter do well in the desert, but I never had any luck overwintering them in cold winters. Ralph Moore varieties to the rescue! 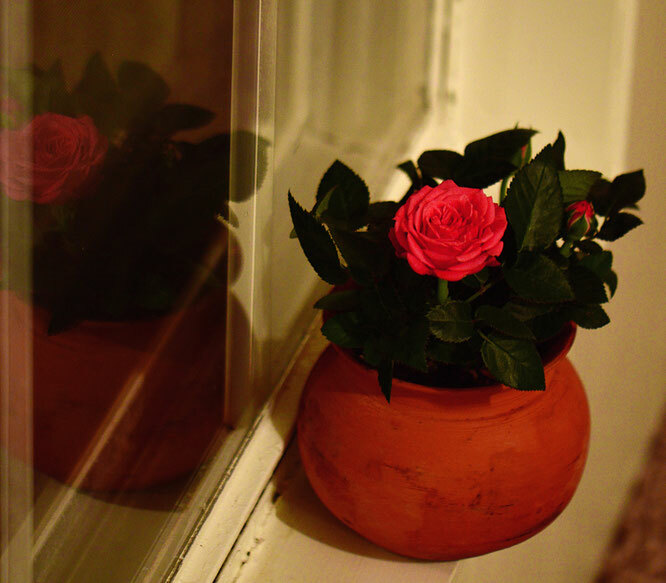 I really like the pot, as well as the rose. they complement each other perfectly. I am not at all surprised the rose somehow fell into your cart. Many plants have done the same to me. Thanks so much, Deb - so glad you liked them! It’s hard to resist a plant that has that take me home look!